Trainer Bob Baffert believes Justify ticks all the boxes ahead of his bid to complete the Triple Crown in the Belmont Stakes. Justify has arrived at Belmont Park safe and sound ahead of his bid to become United States thoroughbred racing's 13th Triple Crown winner. The Kentucky Derby and Preakness Stakes-winning colt was accompanied on the flight from Kentucky by his Bob Baffert -trained stablemate and Belmont opponent Restoring Hope and a stable pony. After walking around the barn for a half-hour or the rangy chestnut colt was given a sponge bath and bedded down in the same stall used by 2015 Triple Crown winner American Pharoah, also trained by Baffert. The trainer said Justify, the 4-5 favourite over nine opponents in the 1-1/2-mile (2400m) Belmont, the final and longest leg of the Triple Crown, signalled his readiness for his task on Saturday the minute he stepped off the truck. "He was, like, 'Let's get it on,'" Baffert told the New York Racing Association. "He didn't get hot. Drank a lot of water when he got off. "We feel pretty relieved he made this stage of the journey. He came in here safe and sound. He was just dragging me around there. All the horses in the barn were screaming and yelling. It's almost as if they were greeting him." "He started this journey just a few months ago. This horse has brought us along. We're just riding his coat-tails. The talent and ability is there. Baffert says the big difference between American Pharoah and Justify is their personalities. "Pharoah loved human contact," Baffert said. "This guy will let you love on him for about four seconds, and that's He bit me when I was walking him around." 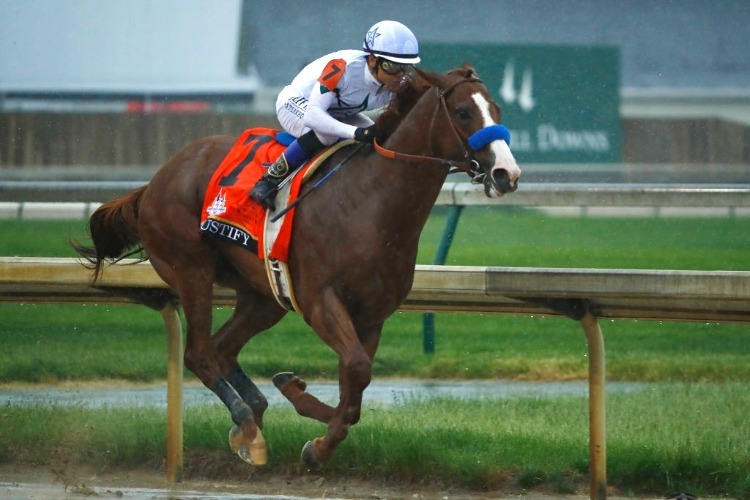 Justify won the Kentucky Derby and Preakness on sloppy tracks and Baffert would prefer a better surface at Belmont.